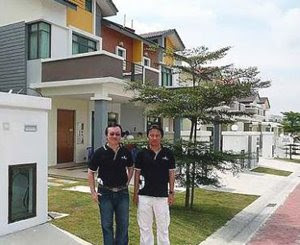 Simon Heng (left) with senior manager, marketing and sales department Kelvin Tang at the Taman Kempas Utama showhouses. “We are looking at RM1bil in gross development value and the project will keep us busy for the next 10 years,’’ Heng told StarBiz. JOHOR BARU: IOI Properties Bhd is banking on the strategic location of its newly launched Taman Kempas Utama within Iskandar Malaysia as the project’s main selling point. Senior general manager (property division) Simon Heng said the project’s location in the Kempas-Tebrau growth corridor augur well for the company. The Kempas-Tebrau corridor is currently the hottest spot for property development in south Johor with more than 10 ongoing projects. Heng said the project was also easily accessible from the North-South Expressway after the Skudai toll plaza, Jalan Kempas Lama and Jalan Senai-Seelong. “We are looking at RM1bil in gross development value and the project will keep us busy for the next 10 years,’’ he told StarBiz. Located on 101.17ha, Taman Kempas Utama will have about 2,000 residential and commercial units, while 20.2ha has been allocated for light industrial buildings. Heng said Tesco Stores (M) Sdn Bhd, the operator of Tesco hypermarkets in Malaysia, would also set up the township’s first standalone hypermarket on 4.04ha next year. The project is the company’s second mixed property development project in Johor after its 2,023.42ha flagship project, IOI Bandar Putra Kulai. Besides upgraders and existing house owners in the vicinity, the project is also aimed at Malaysian professionals working in Singapore, Singaporeans, and pensioners and expatriates based in the republic. 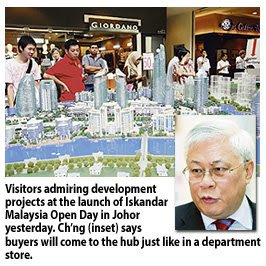 “Demand for high-end houses is still positive in Iskandar Malaysia despite the current economic situation as there are still buyers out there with money,’’ said Heng. He said the commitment shown by stakeholders of Iskandar to ensure that the development of the economic growth corridor continued despite the slowdown would also benefit the property sector. Under the Ninth Malaysia Plan (9MP), the Government has allocated RM6.83bil for infrastructure projects in Iskandar and all the projects will be completed between 2011 and 2015. Projects approved under the 9MP include road improvement packages, drainage works, river cleaning and public housing. These projects are in five flagship development zones in Iskandar – Johor Baru City Centre, Nusajaya, Eastern Gate Development, Western Gate Development and Senai-Kulai. Heng said the continuous inflow of local and foreign investments and the creation of some 800,000 jobs over the next 15 years in Iskandar would boost demand for houses there. He said the company planned to expand its IOI Mall shopping centre in Bandar Putra Kulai next year to cater for the growing number of shoppers. 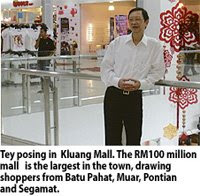 The RM50mil shopping centre, spanning 55,742 sq m, opened in 2001 with 80 tenants and was the only standalone shopping centre in the Kulai-Senai area, he said. Heng said the new wing, to be known as IOI Mall II, would be built on a 4.04ha site beside the existing shopping centre and would have 100 tenants. ATLANTA: UEM Land Bhd, the property development subsidiary of UEM Group Bhd, and Malaysian Biotechnology Corp Bhd (BiotechCorp) plan to jointly develop an estimated 80.8ha of land in Nusajaya, Johor, into a biotechnology (biotech) park. UEM Land strategic marketing and corporate communication director Zulkifli Tahmali said the two companies are expected to sign a joint-venture agreement in the next two months. "We have matters of land, infrastructure, facilities as well as equity to finalise before we can sign the documents," he told reporters attending the 2009 BIO International Convention here yesterday. UEM Land is part of the Malaysian delegation participating at the Bio 2009 Atlanta, the largest global event for the biotech industry, to promote the upcoming BIO Malaysia 2009 in November and the proposed biotech park in the Iskandar Malaysia, called "Bioxcell". UEM Land hopes to start construction on the biotech park by the end of the year. "We will stay true to our developmental expertise and focus on the project and facilities management, while BiotechCorp will bring in the biotech expertise," Zulkifli said. The proposed biotech park will house not only shared facilities such as offices and incubators, but also graduate facilities. Zulkifli said about 50 per cent of the area will be allocated to contract manufacturing companies. It is expected to house 20 to 30 companies of various sizes. "The proposed biotech park in Nusajaya will benefit from its close proximity to University Technology Malaysia, a biosciences institution as well as Singapore's advanced biotechnology industry, and pool of human capital. Bioxcell would be able play a complementary role to the research park which has positioned itself as the place for cutting edge technology," Zulkifli said. He added that the development of a biotech park in Nusajaya will have tremendous spillover effects on the entire development of the area, contributing towards making the development a success. Nusajaya is a 9,600ha development, which is currently home to eight signature projects. 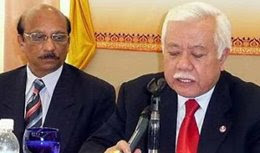 Al-Hadharah Boustead REIT, the only Islamic plantation REIT, recorded a 17 per cent increase in its profit after tax to RM20.236 million for its first quarter ended March 31, 2009 from RM17.314 million last year. In a statement yesterday, Boustead REIT Managers Sdn Bhd's chairman Tan Sri Lodin Wok Kamaruddin said it was mainly because of a gain of RM6.5 million on the compulsory acquisition of investment properties by the government. He said the strong performance was achieved on the back of a revenue of RM15.810 million against last year's RM18.798 million. 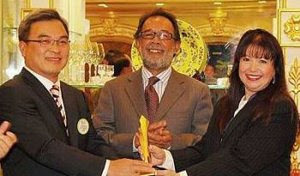 Lodin added performance based profit sharing dipped slightly to RM2.5 million compared with last year's RM2.9 million. "Though there were contraction in crude palm oil prices which affected our performance based structure, our fixed rental income for the period under review grew. "In addition, this gain from the compulsory acquisition of the investment properties by the government went directly to our bottom line. This significant gain of RM6.5 million was a primary contributing factor in psuhing our profits up," he said. He said the company was confident that demand for palm oil will see an upward trend due to its strong popularity although global demand for edible oils has been affected by the credit squeeze and economic crisis. "We are optimistic that palm oil prices will continue to trade at the current steady price range for the year," he said. MALAYSIA must move towards having more "green" buildings, Works Minister Datuk Shaziman Abu Mansor says. He plans to propose that all upcoming government buildings be "green", or environment-friendly, in their design. "In future, I hope whenever there are new government buildings to be built, criteria like energy savings and usage of recycled water would be taken into consideration. This can bring down operations cost for the government," he told reporters at the launch of the Green Building Index (GBI) in Kuala Lumpur yesterday. The GBI, developed by the Malaysian Institute of Architects and the Asociation of Consulting Engineers Malaysia, is essentially a rating system that gauges how "green" a building, be it residential or non-residential, is. "It was initiated to provide the building industry a common and verifiable mechanism to benchmark buildings within the Malaysian context," said Serena Hijjas, a GBI accreditation panel member. For now, the GBI will assess new buildings. Later, it will develop a framework that will enable it to also assess existing buildings. Building owners, developers and consultants can apply to have buildings assessed for a marginal fee, Serena said. "So far, we've done pilots on 11 projects, and more are coming in, so the take-up rate has been very encouraging," said Tan Loke Mun, another accreditation panel member. Asked if the government plans to make it mandatory for all property developers to have their projects assessed, like in Singapore, Shaziman said it was too early to say. "It's still at an initial stage. But on the government's part, we encourage the move towards green buildings," he remarked. In Malaysia, the GBI will rate buildings based on six key criteria, namely energy-efficiency, indoor environmen quality, sustainable site planning and management, materials and resources, water efficiency and innovation. A building will be assessed at the design stage as well as a year after it is first occupied, and then again every three years to ensure that it is well-maintained. A building can be assigned a Platinum, Gold, Silver or Certified rating, depending on the scores achieved.